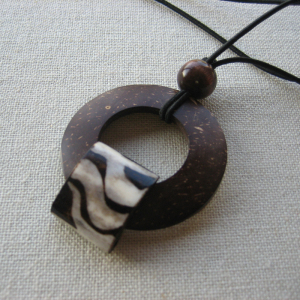 Looking for a way to keep your dreadlocks in check while maintaining a great style? Loc cuffs are a great way to accessorize your locs and add a little hair flair to your everyday style. The first step when using a loc cuff is to ensure that the end of your chosen loc is as smooth as possible. Next, gently but securely hold each loc in place as you slide the cuff from the bottom of the loc up to the desired position. If you select a loc somewhat larger than the cuff’s diameter, the cuff will remain in place until you remove it. Placement of loc cuffs can be used according to your particular style preferences. Loc ties are intended to be used for large sections of locs and are especially designed to accommodate the thickness of locs. The band is made with enough elasticity to stretch over very thick locs without damaging them. One of the benefits of using a loc tie, as opposed to a regular ponytail holder, is that our loc ties are made without any metal clasps or clips to hold the band together. This is especially important to protect your hair from snags, tears and further damage thus helping it maintain its health and vitality. To use your loc tie, first, gather your locs with one hand while holding the loc tie with the other. 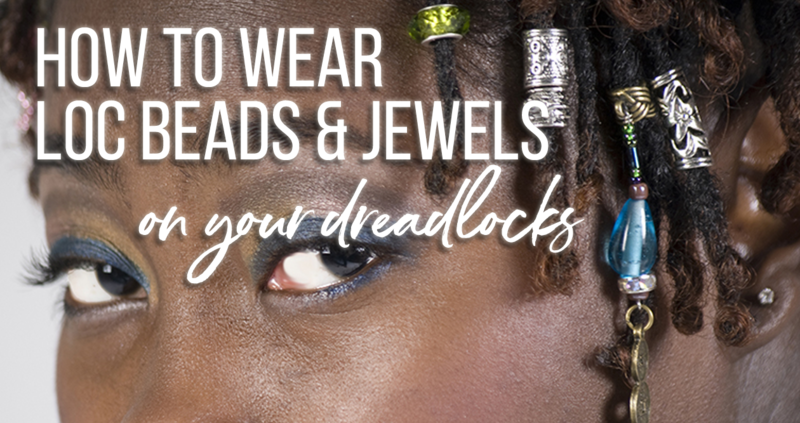 Wrap the band around your locs and secure them by gently pulling the beaded ornament through the loop, then using the toggle clasp to securely hold the loc tie in place. The loc tie can then be slightly adjusted according to your personal preference. There are two different lengths to choose from. Small loc ties are typically used around ponytails, whereas large loc ties can be banded around gathered locs several times or worn as a headband. 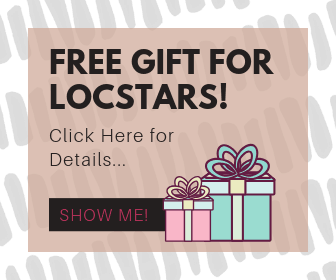 Loc jewels are handmade, one of a kind jewelry you can wear to express the natural mystique that you already carry and to further enhance your personal style — hair flair as we like to call it! Depending on the thickness of your locs, loc jewels and loc beads may require the use of a special tool in order to gently work the locs through the accessory. A loc threader is useful in making this process easier. Using the loc threader will ensure that your locs do not “bunch up” while attaching the jewels, beads and cuffs. First, thread the tool through the end of your chosen loc. Then simply align each loc jewel or loc bead alongside the threader and thread the tool through the loc bead to guide the loc through the bead or jewel. Carefully thread the loc through the accessory and position over the locs. Once the accessory is on, simply slide it to the desired position. For best results, always choose one of your locs (or twists or braids) that has a tapered end. This will make it easier to get the loc started when threading it through a loc bead, loc jewel or loc cuff. You also want to select a loc that is slightly thicker than the opening in the adornment. And be sure to slide the accessory high up enough along the shaft of the loc to hold its position. If you are concerned about the loc sliding, you can use the thread included with your loc threader tool to secure it in place. Your loc threader tool is free and included with every purchase. Lastly, it’s a good idea to remove your natural hair accessory prior to washing your hair unless your goal is for the jewel to become permanently attached. This won’t be an issue with the loc beads because of their thickness but since some of the loc jewels styles use wire and are many times coiled bands, decide your preference (permanent or removable) prior to washing the hair to avoid tangling. As with any natural hair accessory, Loccessories are designed to enhance your appearance and provide you with various styling options. The beauty of K. Hill’s Loccessories is that the collections are uniquely designed and handcrafted. With the help of her creative hand, you can rock your locs with the ultimate confidence and style! This is some of the most fun you’ll ever have in an accessories store, so come visit us often for new styles featuring natural stones for that earthy appeal, cowrie shells for an eccentric look, or Swarovski crystals when you want a bit of bling. 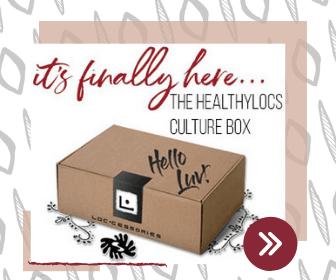 Once you receive your items, be sure to stop back through and let us know how you rock your loc•cessories — we’d love to see your customer photos!